Former IBF and WBA world champion Ricky Hatton believes there is a "good chance" he could fight fellow light-welterweight boxer Amir Khan. 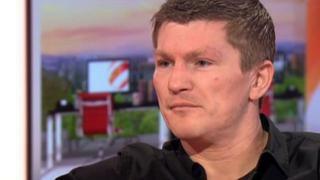 Hatton is set to come out of his retirement against Ukraine's Vyacheslav Senchenko in Manchester on 24 November and says he could face the Bolton-born Khan in the future. Khan, who has lost his last two fights against Danny Garcia and Lamont Peterson, has announced he will fight unbeaten Carlos Molina in December.